The Retropulsion Test: A Good Evaluation of Postural Instability in Parkinson’s Disease? Postural instability is a disabling feature of Parkinson’s disease (PD), contributing to recurrent falls and fall-related injuries. The retropulsion test is widely regarded as the gold standard to evaluate postural instability, and is therefore a key component of the neurological examination in PD. Many variants exist, which confuses both clinical practice and research. Here, we evaluate the merits of this test by discussing three common variants: (1) the pull test as described in the MDS-UPDRS scale; (2) using an unexpected shoulder pull, without prior warning; and (3) the push-and-release test. All variants are a quick method to index the degree of postural instability, but the outcome can vary considerably due to variability in test execution and -interpretation. This partially explains why the retropulsion test fails to predict future falls in PD. Another explanation is that falling results from the complex interplay between gait, balance, cognitive decline and environmental factors, and the retropulsion test captures only part of that. We conclude with several recommendations for current clinical practice. Postural instability is a common and disabling feature of Parkinson’s disease (PD), contributing to recurrent falls and fall-related injuries. Falls rarely occur in the first two years after onset of PD. Indeed, the majority of PD patients experience falls only 5 to 10 years after disease onset, and the debut of falls is later when patients have a tremor-dominant phenotype of PD, as compared to the phenotype dominated by postural instability and gait disability . 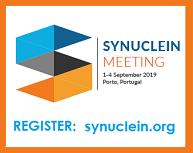 If patients do fall early in the disease (and particularly when this occurs in the first year after disease onset), alternative diagnoses must be considered, in particular one of the various forms of atypical parkinsonism. The retropulsion test is widely regarded as the gold standard to evaluate postural instability, and is there-fore a key component of the neurological examination in PD. A normal retropulsion test distinguishes milder PD (Hoehn and Yahr 1 and 2) from moderate to severe PD (Hoehn and Yahr stage 3 to 5) . Furthermore, an abnormal retropulsion test is often an indication to initiate more intensive therapy, including intensifying dopaminergic treatment or referral to specialized physiotherapy . Use of the retropulsion test includes a rapid balance perturbation in the backward direction, and the number of balance correcting steps (or total absence thereof) is used to rate the degree of postural instability. Healthy subjects correct such perturbations with either one or two large steps, or without taking any steps, hinging rapidly at the hips while swinging the arms forward as a counterweight. In PD patients with balance impairment, balance correcting steps are often too small, forcing patients to take more than two steps. Indeed, it has shown that taking three or more steps is the best way to classify the reaction to the retropulsion test as being abnormal (score of 1 according to the MDS-UPDRS scale) . Taking more than five steps is regarded as even more abnormal according to the MDS-UPDRS. Markedly affected patients continue to step backward without ever regaining their balance and must be caught by the examiner (this would be called true retropulsion). Even more severely affected patients fail to correct entirely, and fall backward “like a pushed toy soldier”, without taking any corrective steps. As shown in Table 1, many variations in the execution and interpretation of the retropulsion test exist, which confuses both clinical practice and research. Here we discuss three common variants: (1) the retropulsion test as described in the MDS-UPDRS scale; (2) using an unexpected shoulder pull, without prior warning; and (3) the push-and-release test. When using the retropulsion test as described by the MDS-UPDRS, balance corrective responses are tested by applying a sudden shoulder pull . The clinician instructs the patient what is about to happen. Patients need to be informed that the clinician will pull their shoulders backwards, and that they are allowed to take as many backward steps as needed to avoid falling (failure to specify this not rarely results in patients letting themselves fall merely backwards into the arms of the examiner). Patients should be told not to shift their weight forward (e.g. by flexing their trunk) in anticipation of the pull. The patient should stand erect with eyes open and feet comfortably apart and parallel to each other. The clinician stands behind the patient and, importantly, must stand sufficiently far away from the patient, allowing enough space for the patient to take several steps to recover balance independently. The examiner must obviously also be ready to support the patient when needed. The MDS-UPDRS recommends applying a mild pull first, which is not rated and serves as a demonstration. The second pull is recommended to be quickly and forcefully applied, and is rated by counting the number of balance correcting steps (Table 2). Scoring performance on the retropulsion test according to this scale is recommended, as this allows for comparison of test results over time and across examiners and different centers, particularly within clinical trials. However, in clinical practice, we also take the quality of the corrective steps into account, as our experience indicates that perfectly healthy subjects sometimes take more than two steps (but these are then always large and rapid, the subject’s balance never being jeopardized). Conversely, it is not rare to see patients take only one or two steps (i.e. formally a normal test result), but we score the test still as abnormal if these steps are slowor small, leading to marked body sway and a clear sense of instability. This is admittedly a subjective score, and actual test performance is noted literally in the medical chart. Finally, note that freezing of gait can sometimes produce an abnormal test result, even when balance per se is actually good, simply because “gluing” of the feet interferes with the ability to take rapid corrective steps. This can be detected by debriefing the patient (was gluing experienced subjectively?) and by observing the typical “trembling” phenotype associated with freezing of gait . Recognizing such freezing is crucial, as this is now regarded as the leading cause of falls in PD . Applying the retropulsion test consistently as recommended by the MDS-UPDRS is important, again for comparative purposes in trial settings. However, we recommend to add a variant prior to the retropulsion test as described above, to address potential shortcomings related to offering prior information about the upcoming procedure and the need to perform a demonstration trial. Specifically, prior instructions and a test trial do not mimic daily life circumstances where fall incidents are – by definition – totally unexpected and unpracticed events. Importantly, the balance responses to the very first and unpracticed balance disturbance are different compared to the subsequent responses to identical balance perturbations, a phenomenon known as ‘first trial effect’ . These first trial responses are qualitatively inferior to the subsequent (and therefore more predictable and trained) perturbations, likely because a startle response overrides the proper balance correction, leading to global stiffening that interferes with rapid balance corrections . And even more importantly, expected retropulsion tests yield different scores than unexpected tests, the latter being more frequently abnormal in patients with PD . Thiswas later confirmed in an experiment using automated and standardized balance perturbations delivered by a moving support surface; the results showed that the responses to the first (fully unexpected) balance perturbation had greater discriminative power to separate PD from controls than all subsequent (practiced) perturbations . 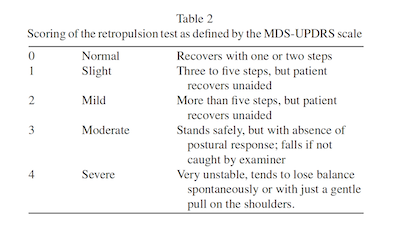 Therefore, prior to performing the MDS-UPDRS variant, we prefer to first examine postural instability by applying one forceful shoulder pull without any specific prior warning (except when patients already manifest spontaneous instability, even without perturbations). Rating is done as described above. After this unexpected shoulder pull, we repeat the retropulsion test as described by the MDS-UPDRS protocol. The response to the second (and predictable) trial is usually better than the response to the very first trial. If not, we usually perform a third and fourth retropulsion test, in which we regard failure to improve the balance correcting response as another sign of postural instability. For both the unexpected shoulder pull and the retropulsion test as described in the MDS-UPDRS, it is of outmost importance that the clinician is prepared to rescue the patient if so needed, should the patient be pulled off balance (this may be particularly the case when the patient is perturbed without warning). To this end, when we perform the shoulder pull, we make sure that the examiner stands with their back close to a wall, allowing sufficient space for the patient to take several stepping responses, but which also safeguards the examiner from falling backwards with the patient. According to the push and release test, the clinician stands behind the patient . The patient is instructed to push backward against the clinician’s hands, which are placed on the patient’s scapulae. The force of the patients push is not allowed to be so strong that the heels are lifted off the ground. A balance perturbationis induced by suddenly removing the hands, inevitably forcing the patient to take one or more corrective backward steps (prior to the test, patients should be instructed to do whatever necessary to regain their balance, including taking one or more steps) . 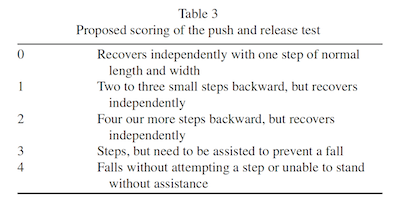 The push and release test is again rated by counting the number of balance correcting steps. The MDS-UDPRS scoring system can be used, but an alternative rating score has been proposed, as shown in Table 3. There is no consensus which trial should be rated, although Jacobs and colleagues suggested to score the third attempt . All three variants of the retropulsion test are a quick method to index the degree of postural instability, but all have disadvantages. A major drawback to the retropulsion test when performed using a shoulder pull is the variability introduced by inconsistency in the strength of the pull, and also by variations in posture and weight of both the patient and clinician. For example, to achieve a comparable balance perturbation, a heavy patient weighing 120 kg needs a much stronger shoulder pull than a frail patient weighing only 60 kg. However, some clinicians might not be strong enough to perturb balance in the first type of patient, or might apply a milder pull on purpose because they are afraid of being unable to support the patient’s balance when needed. Due to this variability, the retropulsion test has only a moderate intra- and interrater reliability, and correlates poorly with objective measures of balance (as scored using quantitative posturography) . The push and release test was developed to overcome this variability, and initial assessments showedthat it indeed yielded more consistent perturbation forces . However, this test also remains subject to variability, as in our experience, many patients are hesitant to push sufficiently strong backward into the hands of the clinician, or merely push the shoulders back while shifting the hips forward. It has been shown that an unexpected shoulder pull – executed once – is more sensitive than an expected shoulder pull (as described in the MDSUPDRS) for assessing retrospectively ascertained falls or near-falls in patients with PD . However, irrespective of its method of execution, the shoulder pull fails to predict future falls in PD . It has not yet been investigated whether the push and release test is more sensitive in predicting future falls, and prospective evaluation of this test is therefore needed. Failure of the retropulsion test to predict future falls is probably related not just to the drawbacks in pull delivery or to the variability and subjective nature in scoring performance. A more important explanation is the fact that falls typically result from a complex interplay between gait, balance, cognitive decline and environmental factors [12, 13]. Single investigations such as the retropulsion test capture only a fraction of this complex pathophysiology. To reliably predict falls, multiple tests are needed that address the various elements contributing to falls; indeed, combining multiple tests improves the predictive power compared to the use of single test .We therefore recommend to perform a set of complementary tests of which the pull test is one, along with e.g. tandem gait performance  and tests for freezing of gait . Additionally,we suspect that it might be better to have a continuous and objective outcome measure to rate corrective postural responses (provided by kinematic or accelerometer data) , rather than a discrete and subjective score (visually counting the number of corrective steps). Future studies need to evaluate the predictive value of such quantitative outcomes, preferably as part of a comprehensive gait and balance assessment battery. Ideally, such studies should take cognitive functioning, activity level and environmental factors into account as well. Pending such work, we recommend to include an unpredictable perturbation as a well as the MDSUPDRS variant, and to carefully document which variant of the retropulsion testwas applied, which scoring system was used, which attempt was rated, how many balance corrective steps were observed, and what the quality of these responses was. This paper was funded by a Radboud University Medical Centre Research Grant to Jorik Nonnekes. Dr. Vivian Weerdesteyn was supported by a Veni Research Grant (916.10.106) of the Netherlands Organization for Scientific Research(NWO). 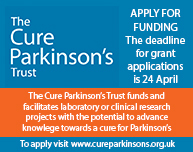 Prof. Bastiaan R. Bloem was supported by a research grant of the National Parkinson Foundation (NPF). Wenning GK, Ebersbach G, Verny M, Chaudhuri KR, Jellinger K, McKee A, Poewe W, & Litvan I (1999) Progression of falls in postmortem-confirmed parkinsonian disorders. Mov Disord, 14, 947-950. Goetz CG, Tilley BC, Shaftman SR, Stebbins GT, Fahn S, Martinez-Martin P, Poewe W, Sampaio C, Stern MB, Dodel R, Dubois B, Holloway R, Jankovic J, Kulisevsky J, Lang AE, Lees A, Leurgans S, LeWitt PA, Nyenhuis D, Olanow CW, Rascol O, Schrag A, Teresi JA, van Hilten JJ, LaPelle N,Movement Disorder Society UPDRS, RevisionTask, Force (2008) Movement Disorder Society-sponsored revision of the Unified Parkinson’s Disease Rating Scale (MDS-UPDRS): Scale presentation and clinimetric testing results.Mov Disord, 23, 2129-2170. Bloem BR, Bhatia KP (2004) Gait and balance in basal ganglia disorders. In Clinical Disorders of Balance, Posture and Gait, Bronstein AM, Brandt T, Nutt JG,Woollacott MH, eds. Arnold, London, pp. 173-206. Visser M, Marinus J, Bloem BR, Kisjes H, van den Berg BM, & van Hilten JJ (2003) Clinical tests for the evaluation of postural instability in patients with parkinson’s disease. Arch Phys Med Rehabil, 84, 1669-1674. 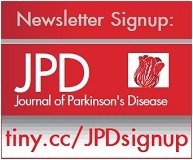 Schaafsma JD, Balash Y, Gurevich T, Bartels AL, Hausdorff JM, & Giladi N (2003) Characterization of freezing of gait subtypes and the response of each to levodopa in Parkinson’s disease. Eur J Neurol, 10, 391-398. Kerr GK,Worringham CJ, Cole MH, Lacherez PF,Wood JM, & Silburn PA (2010) Predictors of future falls in Parkinson disease. Neurology, 75, 116-124. Oude Nijhuis LB, Allum JH, Borm GF, Honegger F, Overeem S, & Bloem BR (2009) Directional sensitivity of “first trial” reactions in human balance control. J Neurophysiol, 101, 2802-2814. Bloem BR, Grimbergen YAM, Cramer M, Willemsen M, & Zwinderman AH (2001) Prospective assessment of falls in Parkinson’s disease. J Neurol, 248, 950-958. Nanhoe-Mahabier W, Allum JHJ, Overeem S, Borm GF, Nijhuis LBO, & Bloem BR (2012) First Trial Reactions and Habituation Rates over Successive Balance Perturbations in Parkinson’s Disease. Neuroscience, 217, 123-129. Jacobs JV, Horak FB, Tran VK, & Nutt JG (2006) An alternative clinical postural stability test for patients with Parkinson’s disease. J Neurol, 253, 1404-1413. Bloem BR, Beckley DJ, van Hilten BJ, & Roos RA (1998) Clinimetrics of postural instability in Parkinson’s disease. J Neurol, 245, 669-673.
 van der Marck MA, Klok MPC, Okun MS, Giladi N, Munneke M, Bloem BR, & Force NFT (2014) Consensusbased clinical practice recommendations for the examination and management of falls in patients with Parkinson’s disease. Parkinsonism Relat Disord, 20, 360-369. Segev-Jacubovski O, Herman T, Yogev-Seligmann G, Mirelman A, Giladi N, & Hausdorff JM(2011) The interplay between gait, falls and cognition: Can cognitive therapy reduce fall risk? Expert Rev Neurother, 11, 1057-1075. Jacobs JV, Horak FB, Tran VK, & Nutt JG (2006) Multiple balance tests improve the assessment of postural stability in subjects with Parkinson’s disease. J Neurol Neurosurg Psychiatry, 77, 322-326. Nonnekes J, Aerts MB, Abdo WF, & Bloem BR (2014) Medio-lateral balance impairment differentiates between Parkinson’s disease and atypical parkinsonism. J Parkinsons Dis, 4, 567-569. Nonnekes J, Janssen AM, Mensink SH, Oude Nijhuis LB, Bloem BR, & Snijders AH (2014) Short rapid steps to provoke freezing of gait in Parkinson’s disease. J Neurol, 261, 1763-1767. Nonnekes J, de Kam D, Geurts AC,Weerdesteyn V, & Bloem BR (2013) Unraveling the mechanisms underlying postural instability in Parkinson’s disease using dynamic posturography. Expert Rev Neurother, 13, 1303-1308.